QuickBooks Online tries to learn your habits as you review downloaded transactions; you can help the process along by establishing rules for QBO to follow. When you set up rules, you speed up the review process because, effectively, you tell QBO in advance how to treat certain types of transactions. Suppose, for example, that you purchase gas for business-use cars from Shell gas stations and you always pay using a credit card you’ve connected to a financial institution in QBO. Effectively, you want to categorize all transactions at Shell stations to your Fuel expense account. You can manually assign the category to one of these transactions and wait for QBO to “learn” your preference, or you can set up a rule for QBO to follow. When you establish a rule, you specify information such as the accounts and the types of transactions (money in or money out) to which the rule should apply. You can create a rule that affects all accounts or a rule that affects specific accounts. You then identify criteria that individual transactions should meet before QBO acts on the transactions. Last, you stipulate the information QBO should assign to transactions that meet the criteria. For example, you can specify a transaction type and a category. You can opt to have QBO automatically apply the rule to all transactions that it determines match the rule’s conditions and add those transactions to QBO. When you use the first approach, QBO identifies, on the For Review tab of the Bank and Credit Cards page, transactions for which it finds and expects to apply a rule. You can identify these transactions because, in the Category or Match column, they display a Rule icon. QBO uses different icons to identify transactions matched by rules but not yet added to your company and transactions added automatically by rules. The second approach might seem risky, but it really isn’t. Even though QBO automatically applies the rule, you can still make changes to transactions that QBO automatically accepts. You set up either type of rule — the one that suggests changes and you must review them, and the one that automatically adds transactions based on a rule — using the same steps. There’s only one step where you do things differently. The Bank and Credit Cards page appears. On the right side of the page, click the down arrow beside the Update button and choose Manage Rules. QBO displays the Rules page. Click the New Rule button in the upper right corner of the Rules page. QBO displays the Rule dialog box. Assign the rule a name — one that will be meaningful to you. Identify whether the rule applies to money coming into QBO or money flowing out of QuickBooks, and select the accounts to which you want the rule to apply. Use the “When a Transaction Meets” section to set criteria QBO should use when examining downloaded transactions to determine whether to apply the rule to them. You can set multiple criteria using the Add Line button, and you can specify that a transaction should meet all or any of the criteria. Specifying “all” is more stringent and QBO is more selective about applying the rule. The first list box in the section enables you to specify whether QBO should compare the transaction description, the bank text, or the transaction amount to a condition you set. For those inquiring minds out there, Description (the transaction description) refers to the text that appears in the Description column of the Bank and Credit Cards page. The Bank Text option refers to the Bank Detail description the bank downloads; you can view the Bank Detail description if you click any downloaded transaction. The Bank Detail description appears at the bottom left of the transactions being edited. Select the Transaction Type QBO should assign to the transaction. Select the Payee and one or more categories to apply to transactions that meet the rule’s conditions. 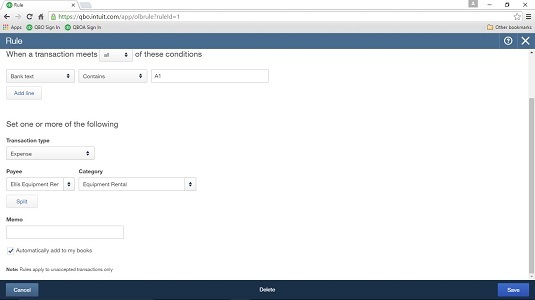 Optionally, add a Memo to each transaction that meets the rule’s conditions. 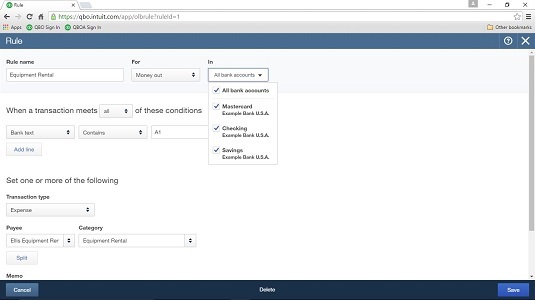 Select the Automatically Add to My Books check box if you want QBO to automatically add transactions that meet the rule’s conditions to your company. This is the “different” step than you find in the introduction to these steps. If you select this box, you don’t need to approve transactions to which QBO applies this rule. But you can always make changes to automatically added transactions. Once you create a rule, you can use the Actions column of the Rules page to copy it (so that you don’t have to create similar rules from scratch) and to delete rules you no longer want. And, if you need to edit a rule, click the Edit button in the Actions column to reopen the Rule dialog box and make changes. Accountants, you can help your clients and save some time if you export and import rules between QBO companies.